We have witnessed social media’s power to topple governments and change public policy. This shift in political power is enabling the general public to engage in the democratic process like never before. One wonders how civil rights leaders and trailblazers that changed our nation in the last century would have used social media tools. Would they have had a more immediate impact, and could they have mobilized even greater droves of people? 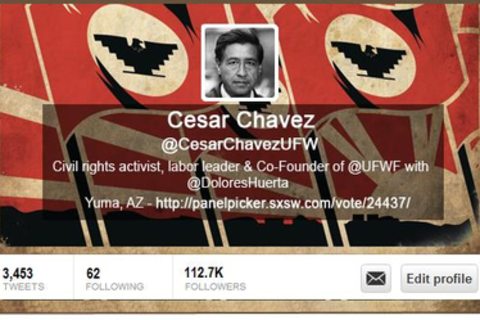 What would Cesar Chavez tweet? As the Latino community grows both in size and its use of mobile technology, the potential for social media to empower this formerly disenfranchised group is greater than ever. This panel provides first-hand accounts of Latino-led campaigns that successfully supported for the confirmations of Supreme Court Justice Sonia Sotomayor, Secretary of Labor Thomas Perez, and support for immigration reform. We will present an insider look on how these campaigns were run, and the contributions of social media to these campaigns. Melody Gonzales is the Presidential Appointments Program Director for the National Hispanic Leadership Agenda, a coalition of 37 pre-eminent national Latino civil rights, non-profit and advocacy organizations. In this role, she manages NHLA's LatinasRepresent partnership with Political Parity to increase Latina representation in elected office and NHLA's Latino Appointment Program --an effort launched in 2013 to identify and support entry-level through Cabinet-level candidates interested in presidential appointments, state-level appointments and careers in the federal government. She also provides support to NHLA's campaigns and committees focused on diversity in government, economic empowerment, education, energy, health care, immigration, voting rights, women’s issues and other key policy priorities. Prior to joining NHLA, Melody worked for President Barack Obama’s re-election campaign as the Latino Vote Director in the battleground state of Virginia. For six years she worked on Capitol Hill with Democratic Caucus Chairman, Congressman Xavier Becerra -- first as a legislative assistant then as Director of Member Outreach for his House Democratic Caucus Vice Chair's office. She also worked for the Democratic Congressional Campaign Committee and Arizona Democratic Party as a GOTV Director supporting Congressman Raul Grijalva’s 2010 re-election and for Barack Obama’s 2008 campaign — volunteering in six states, D.C. and Puerto Rico then working full- time as a Latino Canvass Director in Greeley, Colorado. Passionate about helping strengthen diversity in the political pipeline, Melody served as Vice President of the Congressional Hispanic Staff Association, founded The New Latino Movement (a volunteer- run network dedicated to helping engage, train, empower and connect progressive Latinos through online and on-the-ground strategies), and has been active in encouraging young Latino professionals to get involved in fundraising for charitable and political causes. In her hometown of San Diego, Melody began her career working for the Chula Vista Chamber of Commerce (managing the city’s leadership program), the Chula Vista Convention and Visitors Bureau (as General Manager, promoting tourism for the 7th fastest growing city at the time), and San Diego’s NBC News affiliate (as a writer and assistant producer). Melody holds a Bachelor's degree from the University of California San Diego (UCSD) and a Master of Public Policy degree concentrating in International Policy Development from Georgetown University. She has studied in programs at Oxford University in England and la Universidad de Sevilla in Spain. In March she'll head to Harvard University for additional training as a member of the recently-selected class of the National Hispana Leadership Institute's 2014 Executive Leadership Program. Among her recent honors, Melody has been recognized as one of the “Top Latino Voices to Follow on Twitter” in The Huffington Post, a "GameChanger of 2012" by Politic365 and UCSD's young alumni of year in 2010. As president and chairman of the Cesar Chavez Foundation, Paul F. Chavez has spearheaded the impressive expansion of the organization his father founded in the 1960s under a different name, significantly impacting the lives of hundreds of thousands of Latinos and other poor working families. A 501(c)(3) non-profit charitable organization, the Chavez foundation’s mission is addressing dilemmas confronting poor working people outside the workplace by preserving, promoting and applying the legacy of Cesar Chavez. Under Paul Chavez’s leadership, the foundation has enjoyed unprecedented growth in its four core programmatic areas. It has built and manages high-quality affordable housing with more than 30 communities serving nearly 5,000 low- and very low-income families and seniors in four states. It operates Radio Campesina, a nine-station Spanish-language educational radio network reaching 500,000 daily listeners in four states. The Chavez foundation runs after-school tutoring programs for underserved students. And it works to preserve Cesar Chavez’s legacy through the National Chavez Center based at La Paz in the Tehachapi Mountain town of Keene, California where Cesar lived and worked his last quarter century, and where he is buried. Paul Chavez lives and works out of movement headquarters at the National Chavez Center at Keene, California. One of eight children of Cesar and Helen Chavez, Paul has spent his entire life with the movement. Prior to his work with the Chavez foundation, Paul Chavez served with the United Farm Workers of America as a union organizer, contract negotiator, political director, lobbyist in Sacramento and Washington, D.C., and director of marketing operations. He was also a personal assistant to his father. Paul earned an associate degree in negotiations and collective bargaining at the Fred W. Ross Labor Education Center's School of Collective Bargaining in December 1979.